We’d planned on making it to Phong Nha in 2 days from Ninh Binh, however, after a solid 3-day trek we rounded the corner on the Ho Chi Minh Highway and saw the small town of Phong Nha. We really hadn’t heard too much about this place besides the fact that it was a necessary stop on any bike tour and well worth the visit. Upon arriving we were pointed in the direction of Easy Tiger Hostel. I gave it a quick called and a funny British guy answered and explained that although they had no more room (of a 52-bed accommodation) that we were more than welcome to come by for information, to hang out, play pool, and enjoy some free Wi-Fi. Easy Tiger is quite remarkable. Clearly a new start-up, this place has captured the backpacker market in an area that will definitely see quite a bit of development in the coming years. We walked in and quickly realized why – comfortable seats, cold beer, a fire pit, and a full-size pool table make up the common area that just seems to pull you in. We were given a map and told about a 60km loop of Phong Nha-Ke Bang National Park. Although the hostel was full there are accommodations that line the strip so we simply walked next door and booked a room for $10. After a groovy night at Easy Tiger we woke up early, met two other travellers and hit the road. While the pristine mountainous views, and rolling asphalt roads are remarkable enough, the main attraction is the few caves that line the way. Actually, Phong-Na is home to the largest cave on the planet – yes, on the entire beautiful green earth. It was only discovered in 2008, and ongoing research into the area has shown that there’s quite a lot more to discover. 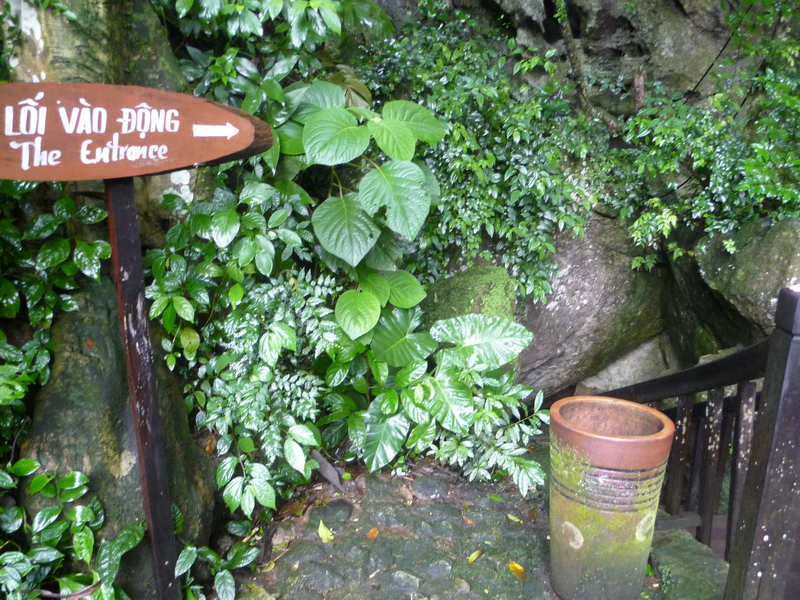 If you take the loop starting from Phong Na, after a solid 20km ride you’ll come upon the first and perhaps most illustrious cave you’ll likely have ever seen, Paradise Cave. This remarkable cave system has a total length that extends for 31km. Entrance to the cave is 120,000d/person ($6), which affords you access into the first kilometer of the cave. For a much larger fee you can hire a guide to trek 8km into the system with a headlamp. But for me, the first kilometer is quite enough. As soon as you step through the narrow opening to the cave you are awestruck by sheer size and the sprawling wooden staircase that leads into the belly of this beast. It’s truly breathtaking – get here early, or head out on a rainy day to avoid the crowds and experience the true ominous feeling this cave can perpetuate – there’s nothing quite like walking through this massive underground space when it’s quiet and dark. After about a good 30-minutes it’s about time to resurface, hike down, climb back on the bikes and hit the road to the next destination, Dark Cave. Dark Cave itself is very beautiful, but the enjoyment of this cave comes from how it’s experienced. It’s a 320,000d/person ($17) entrance fee and for the price you get quite a time. Firstly, you’re told to lock up all your belongings and only take with you a bathing suit – nothing else. You’re given a life jacket, hard hat with a headlight attached, and a harness. It begins by being hooked up to a zip line that sends you down into the river, you then unhook and jump into rather cool water and swim into a massive A-frame cave system. Switching on your headlight you walk into the dark abyss and walk and swim through a rather rugged landscape while following your guide and group. You’re eventually led to a narrow passage that’s simply caked in mud. The guide waits and tell you to continue on for 50m. As you slip and slide your way down the path you begin to realize why you shouldn’t bring anything else on this trek. 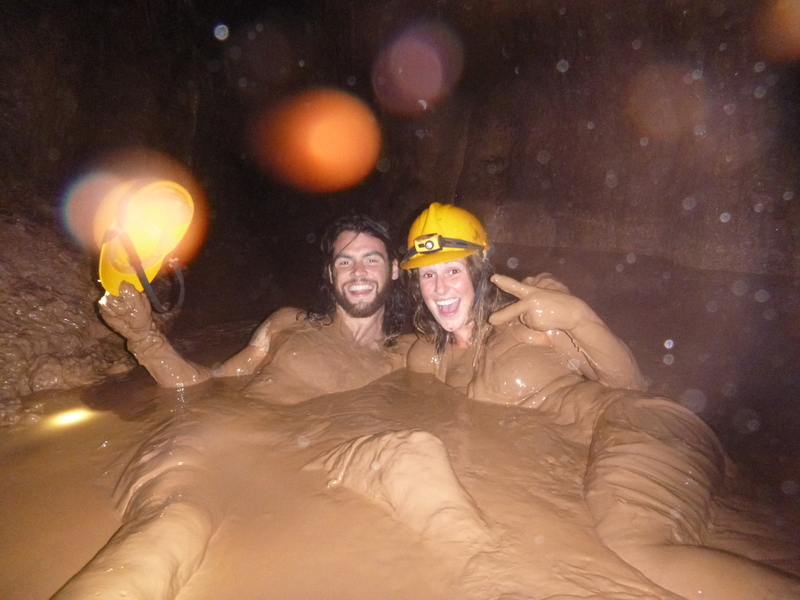 You literally fall into a giant pit of mud at the end of 50 meters that coats your entire body. You can lie back and sit right on the top as the mud solidifies, or move around in a zero-gravity like-feeling – it’s quite enjoyable. After coming out completely brown you hop on a mudslide and slip down into a small pool of water, wash-up and head back out. As you again enter the light you board a kayak and paddle over to another fun little zip line and mini-water playground that just fun to hang out in. For $17 is worth every penny. You finish off you’re loop by driving the Ho Chi Minh back into Phong Na. It’s a solid 6-hour day and you’re feeling great afterwards. We spent our night drinking beer, playing pool, and listening to some live tunes at Easy Tiger, which was completely filled and had a very comfortable vibe about it. 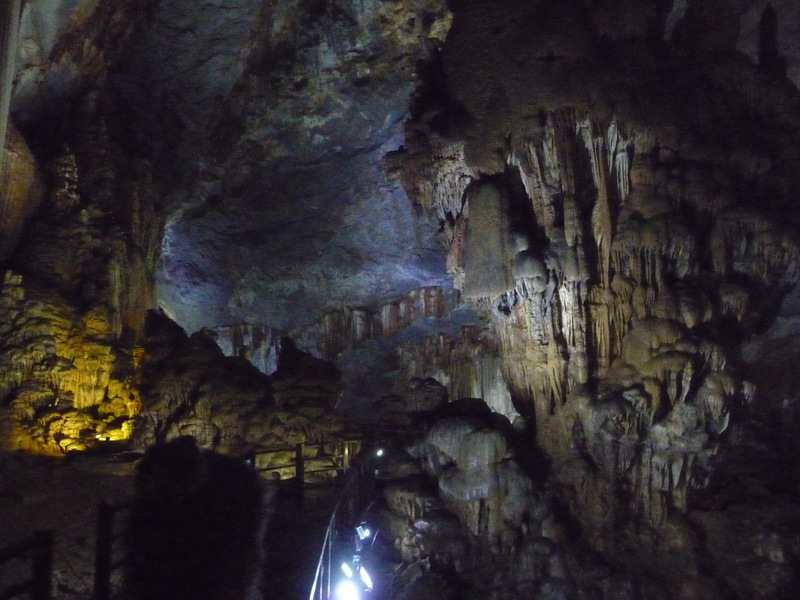 If you’re planning on staying a few more days there’s a boat trip to Phong Nha Caves. This cave system features a rich historical significance from the American War, and you can still see bullet marks from continued attacks by the US. Apparently the Vietnamese army stored a collapsible bridge inside the cave that was pulled out and set up at night to move supplies across a large river. When the US discovered this they repeatedly bombed the area daily, included constant shelling of the cave. The bombs dropped were designed to be dropped from high altitude during WWII, however, they were dropped from low altitudes into soft soil in Phong Nha, and because of this there are many UXO’s (Unexploded Ordinance) around the area. Although MAG has worked diligently at clearing of much of the surrounding area, the deep jungle still contains potential unexploded bombs, which poses a constant threat to the local population. It’s a little pricey to get a boat yourself, but it’s a set price for a 12-seat boat so meet some people in your hostel in the morning, or just hang around and you should have no problem filling the boat in the morning. Phong Nha is simply a must if you’re touring Vietnam, it was definitely the best day-trip I’d had in Vietnam and will surely be a major highlight of my trip. Spend few days or even a week, exploring and learning about this amazing place.